The BNM Alliance (a joint venture between Barhale and North Midland Construction) awarded Aarsleff Ground Engineering the contract to design, supply and install a soil nailed slope to allow, with associated works, the launching of a TBM (Tunnel Boring Machine) for the Severn Trent Elan Valley Aqueduct Rehabilitation project in Wales.The original aqueduct was built between 1893 and 1904. Fast forward over 100 years and the aqueduct still provides drinking water from the Elan Valley to Severn Trent’s customers in Birmingham. The aqueduct transports high quality water entirely by gravity. Having supplied water for over 100 years, the aqueduct is beginning to tire in three key locations and offline replacements are necessary. 8No test nails were installed on the 17th July. These were tested to destruction to confirm the design prior to production works starting. With its Klemm 806 rig, Aarsleff then installed 670no 100mm diameter fully galvanised R32 -280 self-drilling soil nails of 6-16m in length. 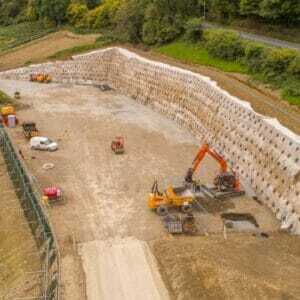 Aarsleff supplied and fixed a steel mesh and geotextile facing. 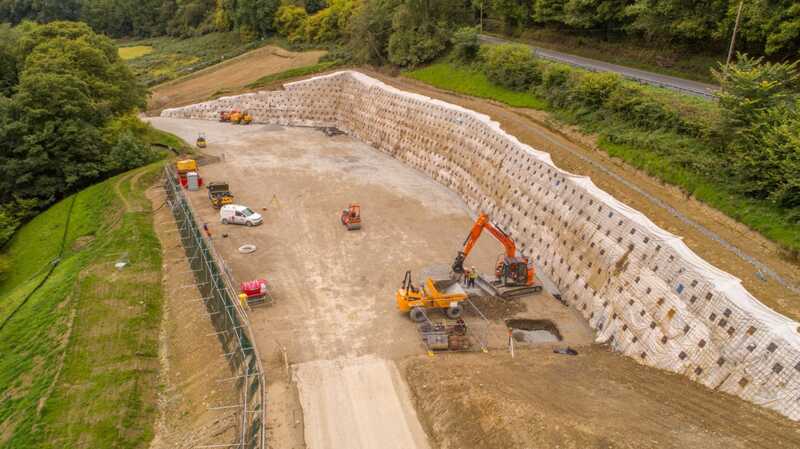 Aarsleff showcased its previous work in soil nail projects of similar size to the main contractor before winning the contract to demonstrate its technical capabilities and expertise whilst simultaneously, assuring the client of cost, time and quality. Aarsleff Ground Engineering sought value engineering primarily through optimisation of the soil nail layout and facing mesh. The self-drilling soil nails were procured from Barnsley-based Minova and possess a hollow bar, which is used for drilling ether with water flush, air flush or cement grout flush and are extended by using couplers. The standard couplers have a design which ensures end-to-end bearing of the hollow bars to transfer percussive energy from the top hammer to the drill bit whilst a sealing ring in the centre stop, minimised flush spillage during drilling. The soil nails also possesses a sacrificial drill bit. The rig we employed is designed for the use of powerful double head drilling units, hydrualic drifters or rotary heads. It can also be equipped with drill masts either with feed gear or cylinder feed systems, with the option of fitting lattice mast extensions, the modularity of which, allows the adaption of a variety of options, which makes the drill rig ideal for anchoring, micro piling, jet grouting and even geothermal drilling. After completion, two percent of all working nails were ‘Acceptance’ tested to validate the design and provide confidence as to the quality of the installation.